A long-time client of 3 Media Web, SALMON Health requested a separate website for recruiting applicants for open positions in any one of their eight locations. They wanted a website with an up-to-date, contemporary feel and design that would be competitive in the sometimes–difficult health care recruitment arena. The SALMON Health Jobs website needed to demonstrate the company culture in a manner that would resonate with visitors looking for employment in an organization that offered more than just a job. 3 Media Web created a website that is attractive and inviting, realizing the client’s goal. 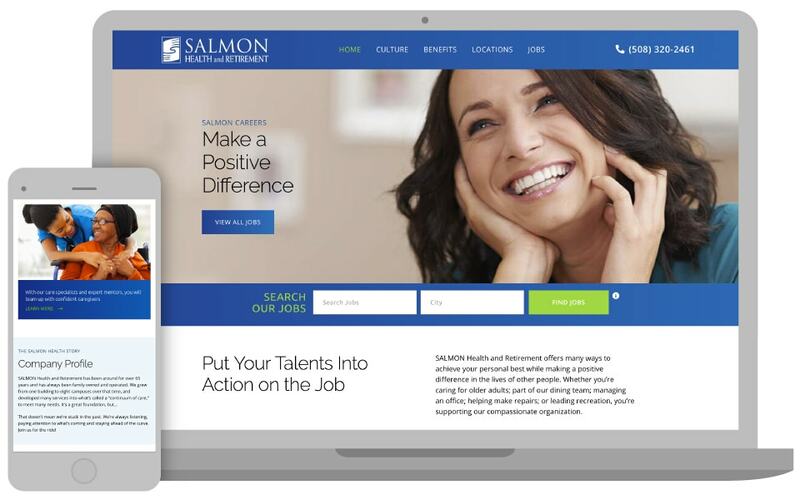 From the hero image of a motivated job seeker on the Home page to the tagline that greets web visitors — SALMON Careers. Make a Positive Difference — and the Call-to-Action to VIEW ALL JOBS, the website focus on the main client’s objectives. This dramatic welcome is followed by an invitation to Search Our Jobs by type or location. An intro that states: Put Your Talents into Action on the Job leads the reader to the Culture page which includes a hero image of happy, employees and a declaration that SALMON is a Family. Below the introduction is a gallery scroll with authentic testimonials by those that work in the Salmon Health organization. Straight-forward and easy-to-navigate, the SALMON Health and Retirement jobs website includes an in-depth Benefits page, Locations listing, and a comprehensive directory of available jobs. Clicking on a link for a position takes the reader to a detailed page for that job with a call-to-action link to an online application. 3 Media Web achieved the clients’ goals by launching an engaging website designed to do one thing: attract potential employees who are looking to make a difference in other people’s lives in a way that makes SALMON Health and Retirement their number one choice for employment.